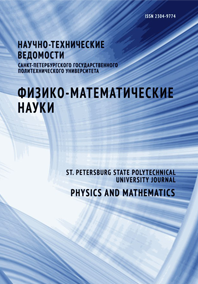 Mamontov Alexander I. Petrakov Anatoliy P. Zimin Sergey P.
In the paper, the surface porosity and morphology of Pb0.97Sn0.03Se films on silicon substrates subjected to anodic electrochemical etching in the Tompkins-Johnson’s electrolyte at a current density of 1 mA/cm2 have been studied using X-ray reflectometry. To reduce the difference in lattice parameters of a growing film, buffer CaF2 layer (about 2 nm thick) and buffer PbSe one (about 400 nm thick) were used. The averaged thickness of re-precipitated near-surface selenium layer was determined to be 45 nm. The X-ray experimental results showed qualitative agreement with electron-microscopical data. It was established by high-resolution X-ray diffraction methods that macroporous structure with transverse and longitudinal porous projections of sizes 47 and 82 nm (relatively) was forming in electrochemical etching. The angle of porous tilt with the surface normal was found to be 34.5 degrees. The applicability of high-resolution X-ray methods to nondestructive investigation of porous structure was shown.